❄【UPDATED】Bright 4W(4*1W LEDS),giving you the Clear Patterns effect, the colors for the slides are updated, so it will not fade away easily. 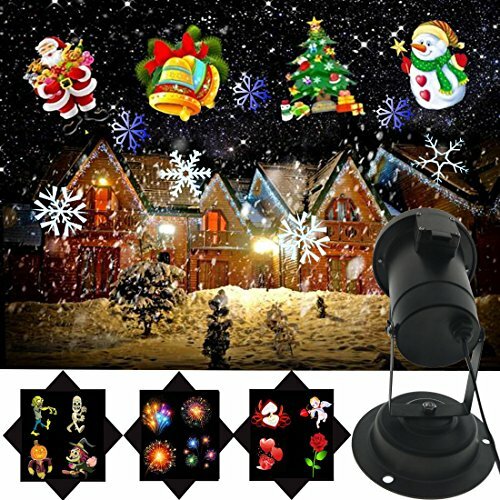 ❄【APPLIED】Suitable for Christmas Decoration, New Year, Halloween, Valentine\'s Day, Wedding, Holiday, Celebration, Festival, Mall, Shop, Bar, Garden, Yard, Club, KTV, Birthday, Family Party and other places. Awesome Christmas Light Show Projector! They really do mean EVERY OCCASION...!